Here are the 3 museums worth visiting, museums that differ from the others in their uniqueness and the purpose. 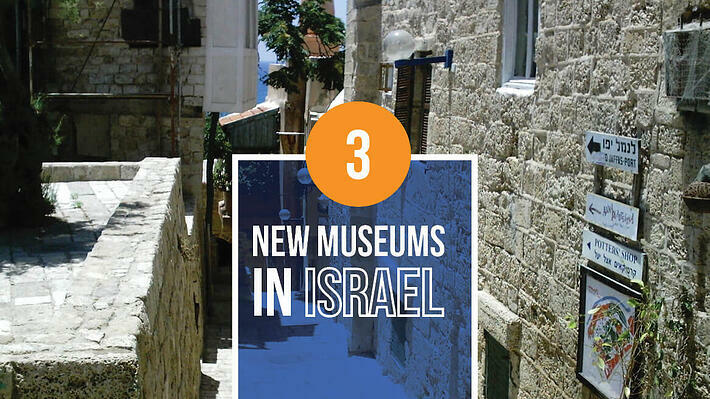 Opened in September 2015, this museum is considered to be the first smart museum in Israel. Located in the center of Jerusalem, in a four floor building, the museum tells the story about help and support of Jewish people by non-Jewish population from around the world, supporters of Zionism, and those who assisted in establishing the state of Israel. Each floor exhibits a different period in the Jewish history. The first floor exhibit tells the story about the 19th century, the second presents the British Mandate for Palestine, the third floor is about the Holocaust and lastly, the fourth floor introduces the period of the establishment of Israel. The museum’s uniqueness lies in the usage of cutting-edge technology, so the visitors can feel as if they stepped back in time. The museum features seven exhibitions, combining 3D technology, original musical score, unique lighting, touch screens and many more. These exhibits tell about different periods in Israel’s history, from the biblical time to the establishment of the Jewish state. Tours in the museum are offered only with the guides. They departure every 15 minutes in groups of up to 25 visitors. The visitors do not have to worry about the presentations, since they are given in 16 languages. What makes this museum even more popular is its location; it is within walking distance from the Old city Jerusalem and it is handicap accessible. After years of waiting, Rishon LeZion finally opened the door of its new museum to the public, in November 2017. The Agam museum is an international center that displays works produced in a six decade long career of Yaacov Agam. Agam is one of the best and world renowned artists, considered to be the founder of the kinetic movement in art. The museum is located in 1 Meishar St. in the Kiryat Ha’Leom compound, the western side of the city. It is a 3200 square meter cavernous building with a sculpture garden surrounding it. The exhibitions illustrate Agam’s worldviews of various aspects, including movement, Jewish symbols, the time dimension, and the perception of reality versus the unexpected. In the future, the museum plans to present other artist’s works, from private collections to other works displayed in various museums in Israel and around the world. The museum will also be used for different kinds of events, such as seminars and conferences, performances, exhibits, all in the spirit of the artist’s worldview and his work. The museum will also offer various trainings, tours and other activities, all in Hebrew, Arabic and English languages. The new museum, The Israeli Innovation Center, is expected to be opened in 2018. The museum will be devoted and dedicated to the most innovative Israeli technologies. The exhibitions in the museum will tell the story about Israel and its ground-breaking inventions, those that changed people’s lives all around the world. Located in Jaffa, the museum will be the center of an educational purpose opened to visitors willing to learn about historic achievements of Israel, take in the core values of optimism, innovation and the peace pursuit. The aim of the museum is to help its visitors and new generations of inventors learn and enrich their knowledge in Israeli innovations, inventors and the processes that lead them to their ideas. Some of these inventions include: ICQ, Rewalk, Waze, drip irrigation, coronary stents, USB flash drivers and many more. To make their guests fully experience the museum’s possibilities, there will be a section of the museum devoted to the contemporary innovation and future technology: every visitor will have a chance to help find a creative solution to the challenge.